A Girl & Her Food: Eggs in Purgatory. Uova in Purgatorio. 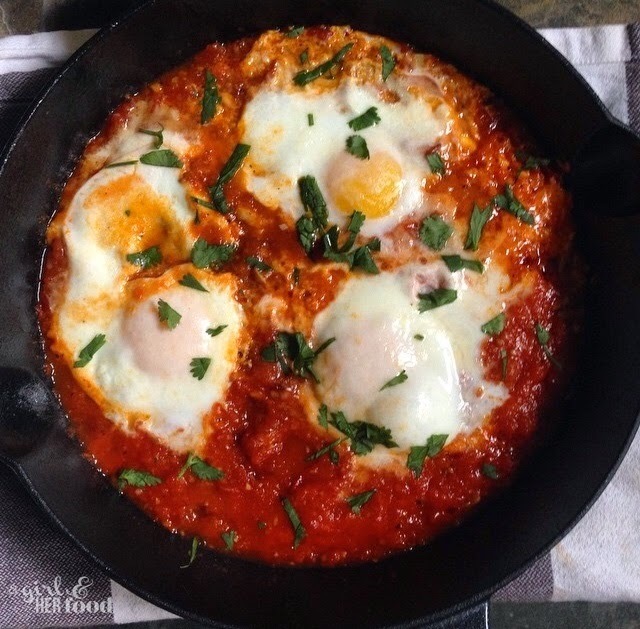 Shakshuka. Eggs in Purgatory. Uova in Purgatorio. Shakshuka. Whatever you call this dish, it's easy to make, fool-proof and it tastes so good. It's my go-to as it is ready under 10 mins and a one-pot wonder. In desperate need for the ultimate hangover cure? This recipe is probably the most friendly and forgiving recipe, to even the most brutal of home cooks, of any recipe that I have ever posted. I prefer to make it for a weekday breakfast or weekend brunch. But it works as a lunch or a weeknight dinner too! Pour the olive oil into a cast iron skillet, add garlic and red pepper flakes, over medium high heat, cook, sitting often, for about 1 minute. Pour in the tomatoes or marinara, season with salt and fresh ground pepper, bring it to a bubble so the liquid is hot enough to poach the eggs. Crack the eggs, sprinkle the grated parmesan cheese, and cover partially with a lid. Let it bubble for about 5 minutes. Be sure to keep an eye on it as you want the egg white set but the yolk still runny. Remove from heat. Place skillet on a trivet with a hand towel. Top with fresh herbs with basil, parsley or cilantro. You can also add more parmesan cheese and salt and pepper according to your taste preference. Use bread of your choice to dunk into the goodness. Enjoy! What's with your comment section? Looks like you are being hounded by trolls! Love the fact that you brought shakshuka and ova'mporatorio together.